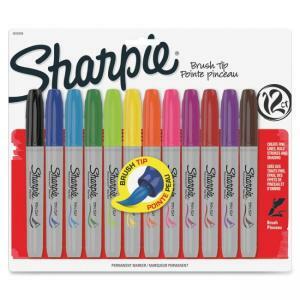 Sharpie Brush Tip Permanent Markers let you create fine lines, bold strokes and shading all with a single marker. The brush tip lets you easily control the width of your lines - thick or thin - with the pressure of your hand. Markers make your ideas permanent on almost any surface. Ink is brightly colored, fade-resistant and water-resistant. 12-color set includes berry, black, blue, brown, green, lime, magenta, orange, purple, red, turquoise and yellow.